This is a part of my Sendai, Japan trip. If you want to have an overview of my entire Japan “Food Odyssey”, I suggest you start with my 7-Eleven review and follow the different links from there. 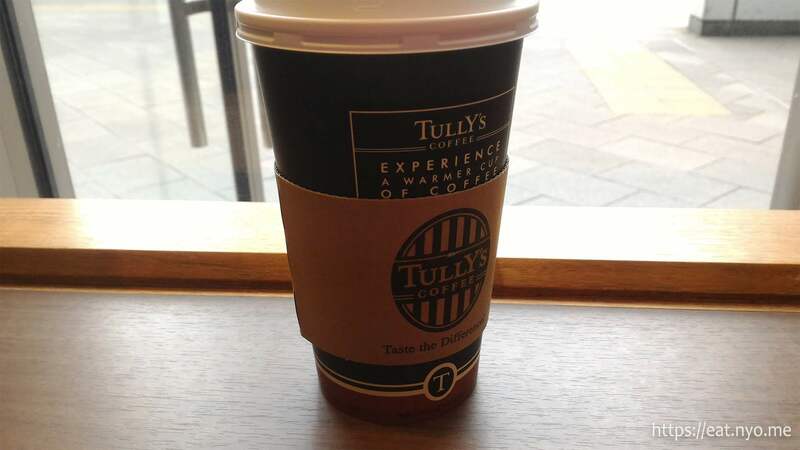 During my third day in Japan, I made a small stop at Tully’s. This coffee chain is pretty much similar to Starbucks or Coffee Bean. In fact, according to Beloved, one opened up in Manila some months ago. Unfortunately, it didn’t really catch on and closed down before I managed to try it. Their menu had English subtitles, fortunately, and I was able to order a Grande Drip Coffee (420 Jpy) easily enough. It was just a short wait and I was given my order to-go. As an aside, I noticed that the service was quite quick for practically everything so far. I didn’t have to wait more than 3 minutes for my Ippudo order the other day, for example, and I didn’t have to wait more than a minute here in Tully’s; the Japanese seems to really do value time very highly. Their Grande Drip Coffee was not sized as I would expect. If I estimate correctly, this is somewhere 16-20 ounces, a bit bigger than the “large” from local 7-Elevens and similar to a “tall” or “large” in Starbucks or Coffee Bean; definitely not “grande” or “venti” on what we have on local chains. As I only have my coffee black, I didn’t put any cream or sugar which was available on the counter. On its own, it had a bit of fruitiness and some very mild natural sweetness to it. It wasn’t as roasty as I prefer my coffee. Still, it definitely did its job to wake me up and it wasn’t offensive to my taste. Unfortunately, I wasn’t able to try some of their pastries as my intermittent fasting schedule disallows me to have breakfast lest I suffer in a comfort room for a while (although, I must admit, that might be a good thing in Japan where all the toilets are equipped with automatic showers for your bottom). I again have to remind myself not to convert the prices and compare it to local economy in order to justify my purchase. Seeing as this seems to be the “regular” price for brewed coffee in Sendai, at least, I’d reckon my visit was fine. If you came from my 7-Eleven review, you can click here to easily continue following my food odyssey in Japan from where you left. Recommended for: Fruity coffee lovers. Smart nomnomnom tip: It has a natural sweetness, so taste before adjusting with dairy and/or sugar.